Welcome to the Cliff Penthouse at Oil Nut Bay. The cliff penthouse is one of the most luxurious and stunningly beautiful 1 bedroom villas overlooking the breath-taking Oil Nut Bay, on the eastern tip of Virgin Gorda. The villa is set on top of a southeast facing cliff offering breath-taking views and is home to The Cliffs at Oil Nut Bay – three individual deluxe one-bedroom rental suites. This luxury one bedroom ocean front villa is situated on the cliff side of Oil Nut Bay facing the wonderful Caribbean waters. 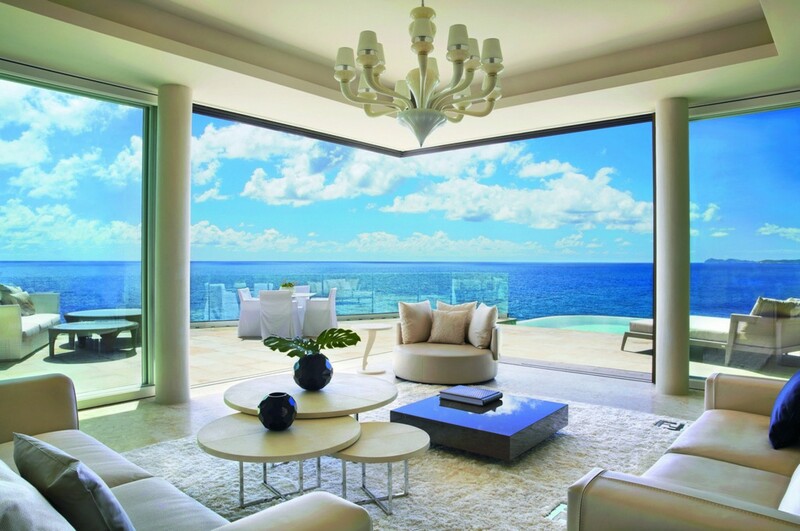 The Cliff Penthouse Suite is 1,334 square feet and is beautifully design with an unobstructed view of the Caribbean. The expansive glass windows of the Penthouse make you feel like you are surrounded by the ocean and provide the feeling of privacy and relaxation. The Cliff Penthouse Suite sits at the highest point of the three villas; two of the villas are set below the penthouse. The cliff penthouse offers a plush interior that is beautifully furnished to the highest standard. Outside, the villa has a wrap around outdoor terrace to enjoy morning coffee and there is a full size swimming pool for guests to relax and unwind. The Penthouse has been luxuriously furnished by FENDI Casa and includes signature FENDI Casa décor and furnishings throughout the living room, master bedroom and outdoor spaces. In addition the Cliff Penthouse is a perfect vacation for honeymooners offering luxury accommodation, stunning views and the most romantic location in the world. While staying at Oil Nut Bay Resort in Virgin Gorda, you will have complimentary access to the Beach Club and will have full use of the wonderful facilities, including three pools, bar and restaurant. We thoroughly enjoyed Oil Nut Bay. See what our experts have to say about this property. Oil Nut Bay is simply stunning. It is a real personal favourite of mine and the Cliff Penthouse Suite is amazing. It is the perfect location for a couple celebrating their honeymoon, a special occasion or just their dream vacation. The views are wonderful of the Atlantic Ocean. Waking up to the sound of the waves is hard to beat. You can relax in the plunge pool while also enjoying this view. The Fendi furnishings really finish off what is an incredibly beautiful suite. It is worth noting that you cannot cook in the suite. There is a fridge and microwave for your use. You can dine at the restaurant or you can also request to eat in your villa. When you arrive here, you will not be disappointed!